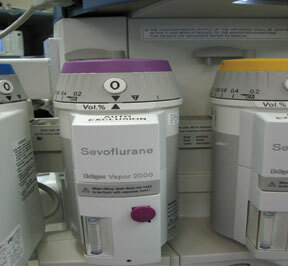 Figure 1: Photo showing mislabeled isoflurane vaporizer located between properly labeled desflurane and sevoflurane vaporizers. Vaporizers have long been color-coded for ease in identification of the different anesthetic inhalational agents. In addition, vaporizers are text-labeled with the specific drug name to identify the agent. We present a case of a mislabeled vaporizer and discuss the importance of color recognition as a human factor in vaporizer design and use. The vaporizer in question was part of an anesthesia work station incorporating a relatively new anesthesia machine for our institution (Apollo, North American Drager). 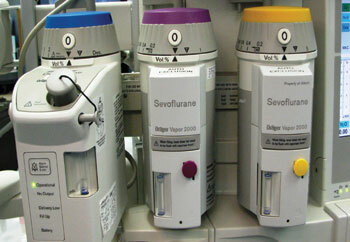 The body of the vaporizer was clearly marked from the factory as “Sevoflurane.” However, the control dial on top was purple, and the purple filler port accepted the purple key for isoflurane; the vaporizer was seated between a blue desflurane vaporizer and a yellow sevoflurane vaporizer. It was unclear exactly how long this vaporizer had been in service with us (Figures 1 and 2). Figure 2: Mislabeled isoflurane vaporizer incorrectly labeled as sevoflurane. Our initial concern was determining exactly which agent the vaporizer contained. Was it an isoflurane vaporizer with the wrong name stenciled on it or a sevoflurane vaporizer assembled incorrectly with the purple plastic parts designating isoflurane? The second point of interest to us was how long it was used before the mislabeling was noticed. The third question was how the vaporizer came to be mislabeled. Analysis of the agents by gas monitoring showed that the vaporizer in question was indeed an isoflurane vaporizer containing isoflurane with correct purple trim but with an incorrect factory-stenciled label. Our assumption concerning how the vaporizer became mislabeled is that the plastic front panel of the vaporizer was switched accidentally when the unit was being factory-reconditioned. This episode demonstrates vividly just how much humans rely on other cues (in this case, color) besides words in a printed label. Over the years, there have been many reports of incorrect medication administration from misreading drug vials and ampules or mislabeled syringes.1 Efforts to decrease drug administration errors continue to this day.2 However, the difference here is that it is likely no one administered isoflurane when they thought they were delivering sevoflurane, because anesthesia professional are so accustomed to recognizing inhalational agents from the color of the vaporizer trim, instead of reading the printed label on the front of the vaporizer. This incident confirms the importance of crosschecking labels with other identifying features prior to administration. But, unlike the case of similarly colored drug vials or ampules, reliance on color for vaporizers, in our case at least, was a more reliable way to avoid administration of the wrong drug. The human propensity to follow color rather than printed labeling for vaporizer identification was significant in our situation. Color coding is a well-known and powerful tool for aiding quick recognition. There is pervasive use of color coding in medicine in general—not exclusively anesthesiology.3 One ubiquitous example is the fact that blood collection tubes are color coded according to the kind of preservative in the tube (and universally referred to as “red top,” “purple top,” etc.). Color coding for medical gases and their tanks and hoses is another example (although the colors may vary around the world). Figure 3: Stroop Test matrix in which one finds it easier to read the correct color/word combinations across the top row than the mismatched color/word combinations across the bottom row. Green, this is called the Stroop Effect4 (Figure 3). Our vaporizer in question produced a variation of the Stroop effect in showing how significantly we were relying on color instead of the printed labeling. Between 5-8% of the general male population is color blind.5,6 Even those not affected will acquire functional color blindness when wearing some kinds of laser-protective goggles.7 Little study has been done on color blindness in anesthesiology,8 especially recently since the introduction of monitoring screens with variable colors for the different parameters displayed. One colleague who has color-blindness reports that he cannot differentiate blue and purple; he therefore relies on not only the label to choose between isoflurane and desflurane, but also the shape of the vaporizer and the range of percentages on the dial. How is vaporizer recognition taught in residency programs? Are residents instructed to crosscheck colors with labels? Or are only the colors emphasized? It is paradoxical that we are concerned with the potential for dangerous medication errors from relying mainly on color or shape with drug vials but seemingly much more casual about reading vaporizer labels. One explanation may be that there is relatively little risk when isoflurane is administered instead of sevoflurane, compared to mistaking epinephrine for ephedrine, or substituting an epinephrine ampule for one of oxytocin when caring for a parturient. In conclusion, we reiterate the importance of reading labels in addition to also crosschecking using other identifying features such as color and placement. Labels on syringes and vaporizers do little good it they are not read. We observed that for many anesthesia professionals, color may be the more habitual method of vaporizer identification, rather than labeling. It is interesting to consider if distinctive agent-specific changes in vaporizer shape would be of benefit to incorporate in future vaporizer designs, in addition to color-coding and proper labeling. The coauthors are affiliated with the Department of Anesthesiology at the University of Kentucky in Lexington. Dr. Rose is an Assistant Professor, Dr. Eichhorn a Professor, and Ms. DiLorenzo an Education Specialist. Bhalani PL. Colour Coding for anaesthesia drugs (letter). J Anaesth Clin Pharmacol 2004;20:203-4. Martin DE. Medication errors persist: summit addresses intravenous safety. APSF Newsletter 2008;23(3):37,39. Foster P. Labeling history reviewed and future explored. APSF Newsletter 2005-06;20(4):86-7. Stroop JR. Studies of interference in serial verbal reactions. J Exp Psych 1935;18:643-662. Cumberland P, Rahi JS, Peckham CS. Impact of congenital colour vision deficiency on education and unintentional injuries: findings from the 1958 British birth cohort. BMJ 2004;329:1074-5. Spalding JA. Colour vision deficiency in the medical profession. Br J Gen Pract 1999; 49:469–75. Harthrong S. Laser goggles can lead to drug errors. APSF Newsletter 2000;15(1):18. Gissen D, Roaf ER. LED monitors and the color-blind. Anesthesiology 1985;62:840.